What happens in your home when the sock monster strikes again after laundry day? I tell you I don’t know how or why our socks always seem to vanish but after a few months we are always out shopping for new socks since we are always left with one sock that doesn’t match. I have no problem wearing miss matched socks, but the males in my home do. So what do I do with all the single socks that don’t have a partner you ask? Well…I’m an old fashioned girl who believes kids should be using their imagination much like I did when I was younger. So we make SOCK PUPPETS from our singular socks! YES sock puppets. I know it sounds old and boring but you make a child use their imagination to come up with stories or put on a show with their sock puppets. It’s nice to unplug the kids from all this technology now a days and get back to good old fashioned using your imagination to play. 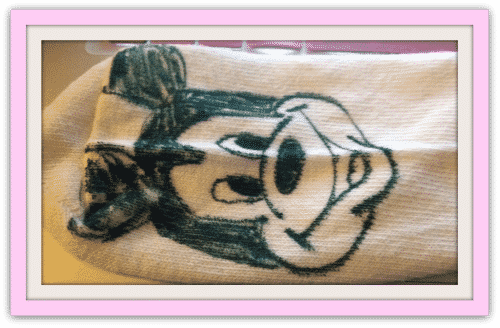 You don’t have to do the tradition sock puppet where your hand is the mouth, you can just draw on the sock and make your favorite cartoon characters as well like…Mickey! All you need to do this is some sort or drawing skills and a sock and a sharpie Marker. I put my NYU animation drawing skills to good use to make sock puppets for my niece and nephew in my home. And I made them for my teen too when he was a kid. 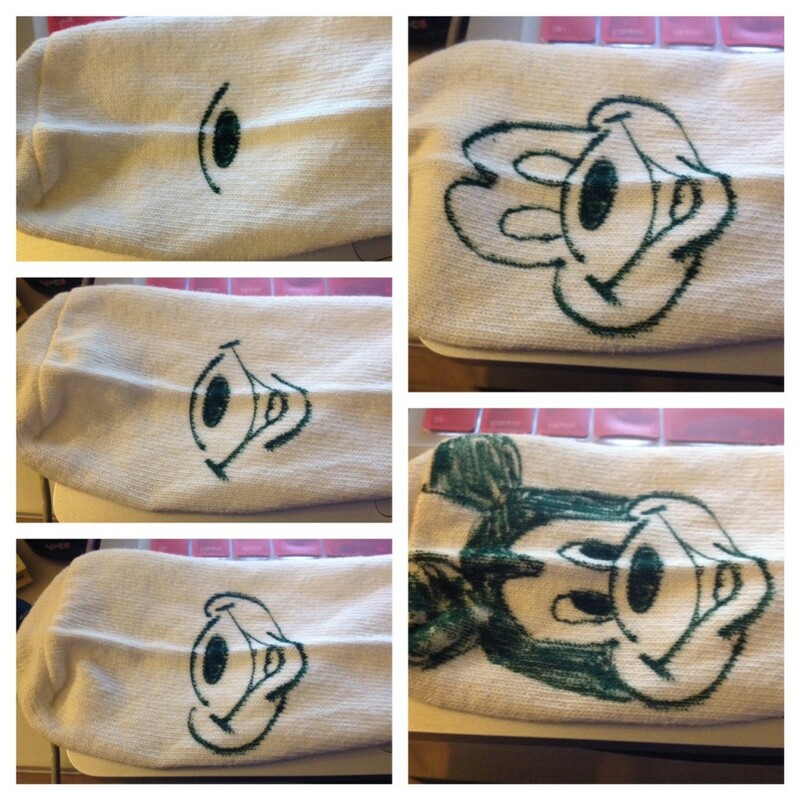 To Make a Mickey Sock Puppet you simply Draw a half oval to start. Then you draw a smaller whole oval underneath that. Then you another half oval for the mouth and add two lines to each side for the mouth. You draw in a line for his mouth and tongue and cheeks. You then draw the eyes and the pupils and then the ears. You can follow the picture above as a step by step guide to how to draw him. It doesn’t have to be perfect and you can have your kids draw on the socks what ever they want. They can even make up their own characters. This is our new Mickey Sock puppet. I think it came out all right! 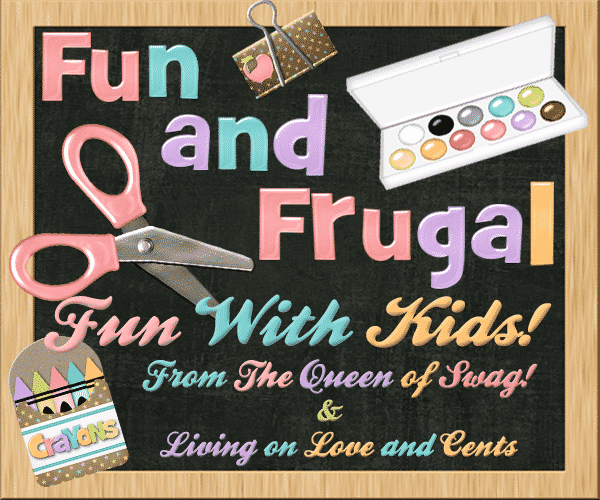 It literally took 5 minutes or less to make and it’s a great fun activity to do with the kids and it costs you nothing to make. If only we could catch that sock monster with our army of sock puppets! I hope you enjoy this idea just as much as we do. Thank you Mom for always finding ways to make me use my imagination when I was a kid so I can pass it on to my own kids and to you all!